The occasional use of a tow-line has made many a journey more comfortable, and many a situation safer. But how long should a tow-line be? 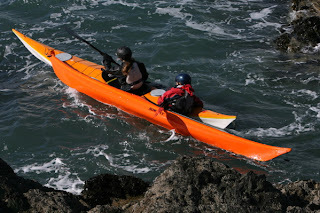 If you're paddling on calm water with no wind then a tow-line should be long enough for following kayak to be clear of the stern of the one towing. 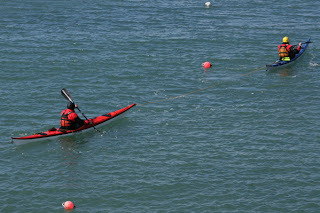 If you're towing with the wind and waves at your back the line should be long enough for the person towing to avoid having the following kayak ride a wave into them. 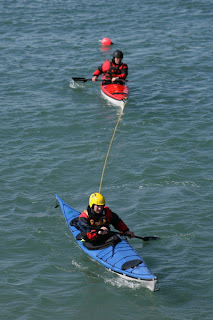 If there are only two of you and the person needing a tow is feeling unstable, then the line needs to be so short the person being towed can hold the stern of the other kayak for support. These examples give an indication of the extremes you might meet. You can cope with most situations with a line 15 metres long, but you might consider some extra line you can quickly add for use in a following sea and a really short tether for close tows.